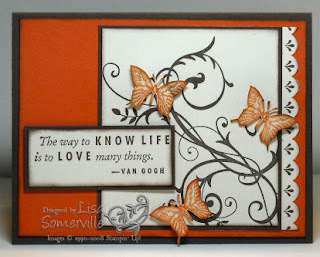 Okay, I just had to dive in and break into the new In Colors, stamps and Scallop Edge Punch. Here's one of the ideas I'm kicking around for one of my group Convention Swaps. I used the Ink Wash Technique from a past issue of the TJNL on my butterflies. To create the scalloped edge, I punched my scallop with the new Scallop Edge Punch, then added the decorative border with one of the stamps from All Scallops. I've always loved adding butterflies to the Baroque Motifs, but my beloved Touch of Nature Butterfly is set to retire, so this new one from Dreams du Jour will come in handy. Beautiful! My stamps should arrive on Monday and I can't wait!! Thanks for sharing. Great card Lisa, the colours and stamps compliment each other well. We are nine months off getting the new incolours in Oz, but it has been nice seeing them pop up recently. This is one I will be paying more attention to. oooooh......aaaaahhh! Lisa this is SO pretty!